A New York Times and international bestseller, translated into 18 languages. In the tradition of The Horse Whisperer comes a novel from the heart that tells a story of universal truths -- of the love between men and women and mothers and daughters; of passion that transcends tragedy; of promises made and promises kept. Set in the majestic Flint Hills of Kansas, Firebird tells of a man caught between two women -- one who shares his life and his dream of land and cattle; the other a stranger whose love threatens to destroy the dream he has built. Ethan Brown is a gentleman rancher -- an Ivy-educated lawyer who is as comfortable amongst his books as he is at ease in the company of cowboys. Engaged to the daughter of the wealthiest landowner in the county, he is within reach of the life he has worked so hard to achieve. Annette Zeldin enters Ethan’s life when she returns from Europe to settle her mother’s estate. A concert violinist, she feels every inch the outsider in the closed ranching community of Cottonwood Falls and clings to her darling young daughter, her lifeline. The time Annette spends with Ethan in his office offers her moments of comfort and communion, and before long, both must acknowledge the passion growing between them. Annette and Ethan begin a clandestine, transcendent love affair that promises to change the landscape of their lives, but is too soon torn apart by tragedy. Yet their connection is soul-deep and everlasting, and their love transforms the lives of those around them in ways subtle and unknown long after its embers have died down. Graham skillfully infuses the novel with ethereal touches that transport the reader from the vast prairies of the Midwest to the intimate realm of the heart. 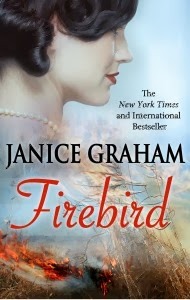 Firebird is a novel that richly articulates the enduring possibilities of love; it is a novel impossible to forget.